Samsung remains a dominant player in the premium smartphone segment. Its latest Galaxy S10 series is flying off the shelves. But it has been facing fierce competition in the mid-range and low-end segments. Since the beginning of this year, the Korean company has been rapidly expanding its mid-range portfolio to thwart the competition. 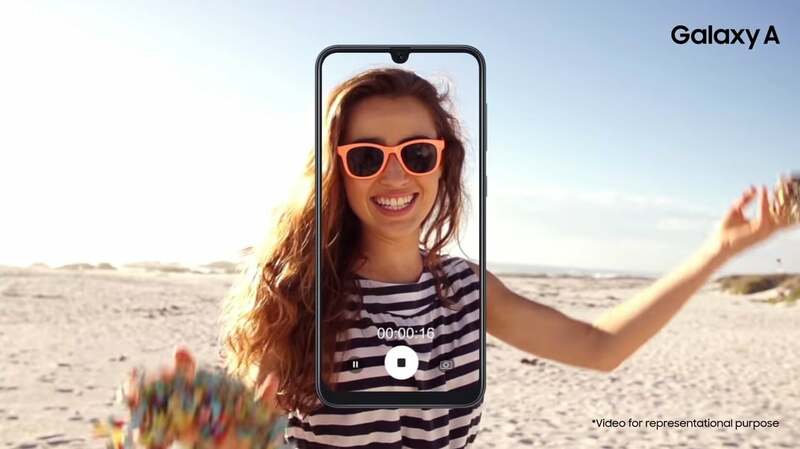 The Galaxy A-series includes the Galaxy A10, Galaxy A30, and Galaxy A50. Samsung has just added Galaxy A20 to the list. The Galaxy A20 will be competing not only with Chinese phones but also with Samsung’s own Galaxy M20. The Galaxy A20 and Galaxy M20 are both aimed at price-conscious consumers, and they both are priced close to each other. 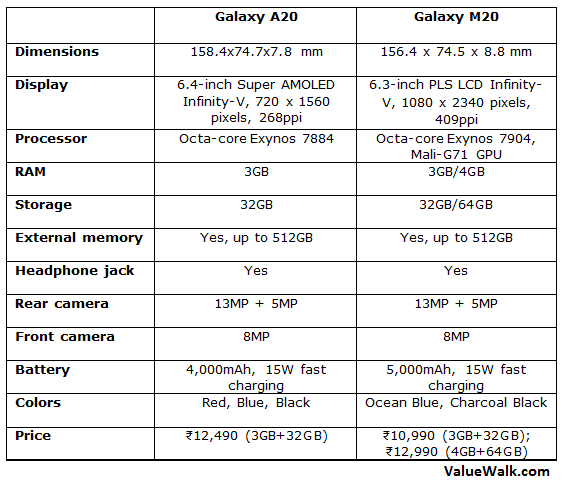 If you are confused which one to buy, this Galaxy A20 vs Galaxy M20 comparison will help you decide which one is better for you. The A20 and M20 have a similar design. Both devices have a nearly bezel-less Infinity-V display with a waterdrop notch to accommodate the selfie camera. The back panel of both handsets is made out of 3D glasstic. The rear panel of both phones features a dual camera setup on the top left corner and a capacitive fingerprint reader. They both come with the 3.5mm headphone jack and USB Type-C port. The A20 measures 158.4 x 74.7 x 7.8 mm while the M20 measures 156.4 x 74.5 x 8.8 mm, making the M20 slightly thicker than the former. The A20 comes in Red, Black, and Blue colors. In contrast, the M20 is available in Ocean Blue and Charcoal Black color options. This is where you’ll notice a big difference between the two phones. The Galaxy A20 features a 6.4-inch Super AMOLED Infinity-V display. The Super AMOLED display delivers more vibrant colors and deeper blacks than its LCD counterparts. It has a 19.5:9 aspect ratio and 268ppi of pixel density. It has an HD+ resolution of 720 x 1560. The Galaxy M20 gets a TFT LCD panel, which is not as good as the Super AMOLED screen of A20. But it has a Full HD+ resolution of 1080 x 2340 pixels. The M20 sports a 6.3-inch display with 409ppi pixel density, 19.5:9 aspect ratio, and 83.6% screen-to-body ratio. The A20 is powered by Samsung’s own octa-core Exynos 7884 processor. It comes with 3GB RAM and 32GB of internal storage. The phone supports external storage of up to 512GB via a microSD card slot. Just like M20, it supports dual SIM cards. The M20 runs a more powerful octa-core Exynos 7904 chipset paired with 3GB or 4GB of RAM. It comes in two storage options of 32GB and 64GB. There is also a microSD card slot for external memory of up to 512GB. It is capable enough to run high-end games such as PUBG without any hiccups. The A20 packs a giant 4,000mAh battery with 15W fast charging support. The battery is large enough to last a full day of normal usage. If you want an even bigger battery, the M20 features a huge 5,000mAh battery with 15W fast charging. It can easily get you through two days on a single charge. Both of them run Android, but the experience is dramatically different. The Galaxy A20 runs Samsung’s latest One UI skin on top of Android 9 Pie. The One UI skin has a new interface that brings all the interactive elements to the bottom of the screen for easy one-handed navigation. It also has a system-wide Dark Mode. The M20 ships with the older Android 8.1 Oreo software and the Samsung Experience UI 9.5. It’s not as impressive as One UI on Android 9 Pie. However, the Korean company has promised to upgrade the Galaxy M20 to Android Pie later this year. Both the phones sport a dual camera setup on the back. The A20 features a 13MP wide-angle lens with f/1.9 aperture and a 5MP depth sensor with f/2.2 aperture. The depth sensor allows you to take portrait images with blurred backgrounds. It has an 8MP selfie shooter on the front. The M20 sports a 13MP wide-angle lens with f/1.9 aperture and a 5MP ultra wide-angle sensor with f/2.2 aperture. The front-facing camera is 8-megapixel. Both handsets can record Full HD 1080p videos at 30fps. The Galaxy A20 is priced at ₹12,490 (about $180) in India. It gives you a Super AMOLED display, 3GB RAM, and 32GB of storage. The M20 is available for ₹10,990 for the 3GB RAM/32GB storage variant and ₹12,990 for the 4GB RAM/64GB. It means the A20 is priced close to the high-end variant of M20. If you can do without the Super AMOLED display and One UI software, the 4GB RAM variant of M20 is great value for money. It gives you an extra RAM and storage, a bigger battery, a more powerful processor, and a Full HD+ display.